We are just over two weeks away from the Boston Summit! Thank you to J5 for helping organize the Boston Summit and finding rooms. More information is available on the Boston Summit wiki page. Let us know you’re coming – add your name to the wiki here. Want to give a talk about something? Organize some hacking time? Participate in another project? Add your ideas on the wiki! Boston Summit is an unconference but a little planning never hurt either. Posted on October 19, 2010 Author pcutler2 Comments on Boston Summit is coming! It’s been a while since we last had an IRC meeting of the GNOME Foundation, so we’d like to invite you all to join us once again! Foundation IRC meetings are just that, meetings held on #foundation in irc.gimp.org to discuss current matters related to the GNOME Foundation. Any GNOME Foundation member or non member are welcome. As long as you contribute positively to the discussion you are welcome. The meeting is moderated by Board members that are present, and they will guide the discussion through all the Agenda topics. Everyone can comment and speak at any time, just remember to be respectful and concise so it’s easy for everyone to follow the discussion. We already have a few topics to discuss but this is a great opportunity to discuss the topics you care about, or to get more information from the Board if you think we’re not communicating enough on some topics The agenda of the meeting is really up to you! The GNOME Foundation is looking for developers to enhance the developer experience of using GTK+ to port and create applications on MeeGo Handset devices. Knowledge of the MeeGo Handset development process, and GTK+ internals will be required to carry out the work. Ensure that GTK+ applications display as expected on the MeeGo Handset platform, including checking that fixes to the compositor are made if necessary. Add to upstream GTK+ helper functionality to create stand-alone GTK+ applications to run on MeeGo. Merge Hildon widgets functionality into GTK+ upstream, where it makes sense to do so. The money available for the project is $50,000, and the bidder selection will be made by a group including professional consultants with GTK+ and MeeGo experience and GNOME Foundation Board members. Details of your research into what GTK+ functionality needs to be added to ease porting of stock applications to MeeGo Handset. References to previous MeeGo, MeeGo Handset, Maemo, or GTK+ work. Note that the goal of the GNOME Foundation for this project is upstream acceptance of the various modifications made during the project. Please send your proposals to board-list@gnome.org with the subject line “MeeGo Handset Bid”. The Desktop Summit is a co-located event which features the yearly contributor conferences of the GNOME and KDE communities, GUADEC and Akademy. Next year the conference will take place from 6 to 12 August, 2011 in the city center of Berlin at the Humboldt University, Unter den Linden. The event will feature keynotes, talks, workshops and team building events. Find the official announcement of KDE e.V. and the GNOME Foundation here and the Desktop Summit website here. The GNOME and KDE communities develop the majority of Free Software desktop technology. Increasingly, they cooperate on underlying infrastructure. By holding their annual developer flagship events in the same location, the two projects hope to foster collaboration and discussion between their developer communities. Furthermore, KDE and GNOME aim to work more closely with the rest of the desktop and mobile open source community. The summit presents a unique opportunity for all of us to work together and improve the free and open source desktop for all. At the Desktop Summit 2011 the organizing team expects well over a thousand core contributors, prominent open source technology leaders, government, education and corporate representatives and hundreds of open source desktop engineers, usability experts and designers. Local and international IT industry are invited to learn about and join in developing the latest innovative desktop technology. 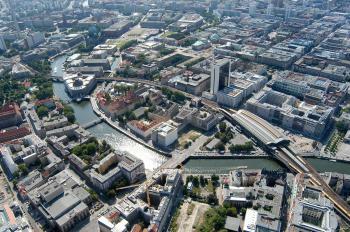 The event is locally supported by the TSB Innovation Agency Berlin GmbH and the Berlin Senate. The conference will take place at the 200 year old Humboldt University in the district of Under den Linden, part of the city center of Berlin. This area has plenty of good hotels and hostels, great restaurants and shopping areas and good public transport – all that in walking distance. 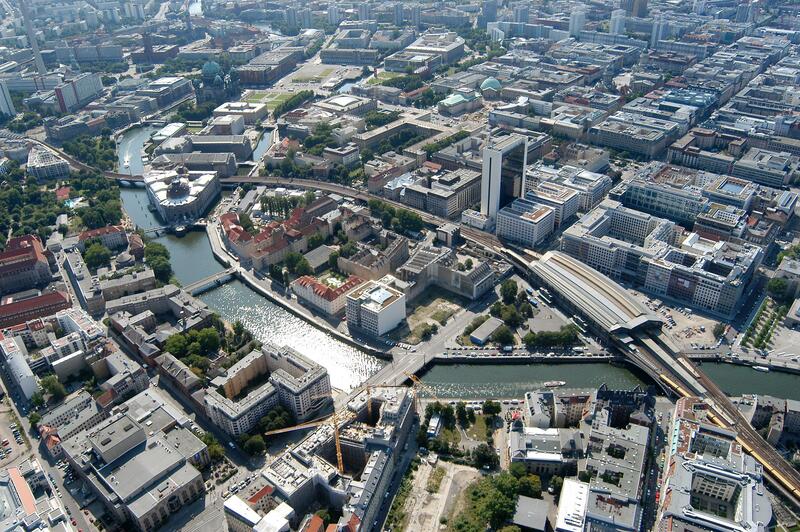 Cultural needs can be met by the near-by Deutsches Historisches Museum, the City Library of Berlin and many other prominent buildings and institutions. A must-see for visitors of Berlin, the Brandenburger Tor, can be found on the street the university is on. The registration for the Desktop Summit will open on 1 February 2011 and a call for papers will be issued. Talk submissions will be due on 15th of March and one month later the conference program will be announced. Saturday 6 August kicks off 3 days of joint keynotes, talks and social events followed by four days of collaborative workshops. The conference officially ends on Friday, 12 August. 1 February: registration for Desktop Summit will open; Call for Papers issued. 15 March: Deadline for travel & hotel reimbursement requests. Registration remains open until the conference. 15 April: Feedback on travel and hotel reimbursement requests. Meanwhile the website went online on DesktopSummit.org where you can read a bit of information on the conference, its history, the upcoming desktop summit and the location. More content will be added over the coming months. You can also subscribe for news on the conference so you will be notified whenever there is something going on. I interviewed the final candidates for the system administration position, we made an offer and … welcomed Christer Edwards as our new system administrator! He’s already done great work in just the past couple of weeks. Thanks to our interviewers Jonathan Blandford, Bradley Kuhn and Brad Taylor and a special thanks to Paul Cutler for putting it all together. Kicked off some work with InitMarketing to do some of the template presentations for GNOME folks to use when presenting about GNOME. Had a GNOME advisory board meeting where we updated them on all the things going on and asked them for feedback. We had discussions about hackfests and events (including plans for the Desktop Summit 2011), the Outreach Program for Women, 2011 budget planning and GNOME a11y. The advisory board meets once a month; let me know if you have suggestions for meeting topics. Talked to a CiviCRM contracting company about getting some of the integration and customizations done that we need, like integrating it with Paypal and Friends of GNOME. If there are any CiviCRM experts in the GNOME community, let me know! Met with Peter Brown from the FSF and Brian Cameron from the GNOME Board of Directors to discuss areas where we might collaborate, like accessibility. 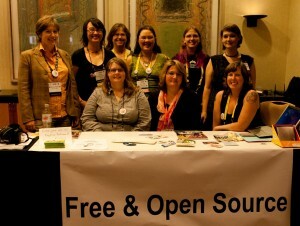 Put together the Free and Open Source Software booth for Grace Hopper with lots of help from these awesome women and all the organizations (Canonical, Red Hat, Novell, FSF, GNOME and Oracle) that sent us goodies to hand out. And thanks to the Grace Hopper folks who gave us the booth space! Free and Open Source Software Booth at Grace Hopper. Sitting: Leslie Hawthorn, Amber Graner, Deb Nicholson. Standing: Stormy Peters, Selena Decklemann, Cat Allman, Terri Oda, Carol Smith, Corey Latislaw. We handed out 180 fliers about the GNOME Outreach Program for Women program too. I also helped out with the Open Source Track and that was a great success finishing with a Sahana codeathon. Thanks to Jennifer Redman for making the track and the codeathon happen. Thanks to the NSA for sponsoring it! Both the attendees and the conference speakers at GHC were all extremely motivating. I got to meet with lots of interesting people including Heidi Ellis whose class is working on Caribou as part of GNOME’s a11y and HFOSS program. Kept up to date on the Desktop Summit 2011 planning. A big thanks to Andreas Nilsson, Dave Neary, Reinout van Schouwen, Kat Gerasimova and others for representing GNOME at the Desktop Summit 2011 planning meeting. Sent out the notice about the 2010 Q2 Quarterly Report. (It was published in August.) Thanks to all the teams that are already sending out a call for the Q3 report! Reviewed the GNOME 2.32 release notes. Thanks to Paul Cutler for keeping the release notes going! He could use help with writing and with screen shots. Put together email and website for launching the GNOME Ambassador program. Need to launch it now! Announced that the GNOME Foundation and LWN will be giving an LWN.net subscription to all Friends of GNOME subscribers! Thanks, LWN! Sent out a call for people to help with our end of the year subscriber campaign. Exchanged a few emails with women who applied to the GNOME Outreach Program for Women that are interested in marketing. Thanks to Marina Zhurakhinskaya for answering all the rest of the mails (even a few difficult ones) and making the whole program happen! Met with Phil Robb from HP. Talked about Palm, GNOME and Accessibility. Worked with the marketing team on a GNOME ad for Linux 92. Thanks to Joey Ferwerda and Máirín Duffy. Cat Allman gave me the good news at Grace Hopper that Google has some funding for the GNOME Outreach Program for Women! Mozilla is funding the Snowy hackfest! Snowy is the server side of Tomboy Online. Working with several organizations on some funding for a11y. Worked with Joanie on a write-up of goals. Pinged a lot of people about a lot of things. Extremely grateful to the GNOME community for all the hard work they do!